Brooklyn Bridge Walk - How Long is It? Located in the heart of New York City, this bridge connects Manhattan and Brooklyn, two boroughs with the population of more than four million people. Obviously, the importance of the Brooklyn Bridge is huge, so it’s not a big surprise that it’s one of the largest bridges in the city. Actually, the Brooklyn Bridge is the 3rd-longest bridge in New York City, behind the Manhattan Bridge and the Williamsburg Bridge. So, how exactly is the Brooklyn Bridge long? The answer is 5,988 feet or 1.134 miles. Obviously, it’s a pretty long distance, but it doesn’t mean you can’t cross it by foot. In fact, a huge number of people decide to do it. The reason is not just that the traffic can get jammed, so that driving over the bridge would take longer than going on food. It’s also because walking over the Brooklyn Bridge gives you an amazing view of the city. According to official stats, over four thousand people cross the Brooklyn Bridge on foot each day. A great thing about it is that the pedestrian walkway is above the automobile lanes, which means that they get to breathe clean air and have an even better view of Manhattan and Brooklyn than those traveling by car. For those reasons, walking over the Brooklyn Bridge has become a sort of tourist attraction. This is why if you’re in a hurry, you might find yourself trying to dribble past the tourists taking selfies or simply walking too slowly for your taste. Furthermore, you too might get distracted along the way, as there are many places on the bridge that offer amazing views of the city. The chance is high that you’ll want to make a short break and enjoy the landscape. How long does it take to Cross the Brooklyn Bridge by Foot? Unfortunately, there isn’t the ultimate answer to this question. It all depends on many factors, starting with how crowdy it is. At some times during the day, tourists go the bridge to take photographs of the city. It usually happened in the afternoon, meaning that crossing the bridge in the morning is fairly easy. The second factor is your physical condition. There are many people jogging over the bridge in the morning, but if you’re not one of them, you will probably need about half an hour to cross it. Sometimes even more! For example, it can get pretty windy up there, so you might be walking against wind as strong as 40 mph. Another factor that decides how much time you’ll need to cross the bridge is the reason why you’re going over it. If this is a part of your daily commute, then you better hurry. But, if you’re a tourist, you can take your time and enjoy the experience. If this is the case, make sure to bring a camera with you, as there are some parts of the bridge that provide truly breathtaking views. The fact is that once you get up there, you will be able to see a big chunk of Manhattan, as well as Brooklyn and a few other neighborhoods of New York. However, some parts of the bridge simply offer better views than the others. Here are some of them! Washington Street – If you want to make the Brooklyn Bridge the star of your photos, a good idea is to do it at the entrance. If you’re coming from Brooklyn, take a moment to take some selfies at the bridge entrance on Washington Street. You’re guaranteed to make awesome photos here with the massive sign saying Brooklyn Bridge in the background. Brooklyn-side arch facing Manhattan – This is probably the most popular spot on the bridge for those who want to make awesome photos of the city. This part of the bridge offers amazing views of Manhattan and its skyscrapers, making it perfect for panoramic photo-shooting. Unfortunately, it seems that everyone knows about this, which is why this part of the bridge is almost always crowded with tourists. Under the archways – If you wanna take a photo of the bridge, this seems like a perfect spot. You can take selfies with the arch in the background, although you won’t be able to catch a big part of New York skyline from here. At least, not as much as you would from some other parts of the bridge. Midway facing west – Here’s another place that seems great for taking selfies. If it’s a bright day, you will be able to make some amazing photos with you, the bridge, and Manhattan skyline in the frame. From here, you will also be able to see the Statue of Liberty, although not too well without binoculars. Midway facing east – This is a spot that gives you a great view of the Manhattan Bridge, as well as Empire State Building. The Brooklyn Bridge Pedestrian Walkway has a special lane that’s reserved for the cyclists. It’s marked by a yellow line, but it seems that not many people care about it. The thing is that some tourists simply get distracted by the amazing views that the bridge offers. This is why you need to be extra careful not to run them over. Our advice is to try to avoid cycling over the bridge when there’s too much crowd. Usually, tourists get to the bridge in the early afternoon or just before the sunset, especially during summer. So, it seems that the best solution is to take a bike trip over the Brooklyn Bridge early in the morning. Actually, cycling seems like a great method of exploring not only the Brooklyn Bridge but other the whole city. In fact, New York is a pretty bike-friendly place, with bike paths all over Manhattan. 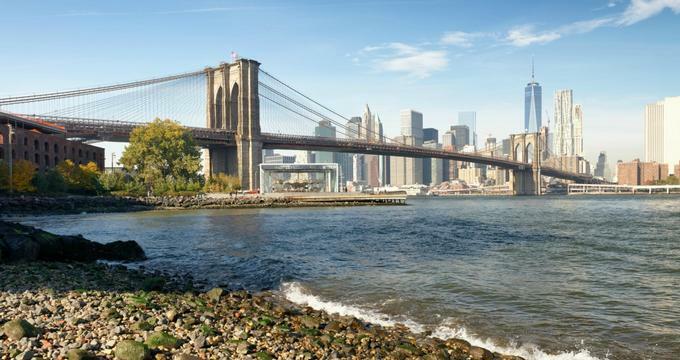 Here’s a suggestion you might like – cycling over the Brooklyn Bridge all the way to the Central Park, passing a number of NYC landmarks along the way – Empire State Building, Rockefeller Center, Trump Tower, and so on.